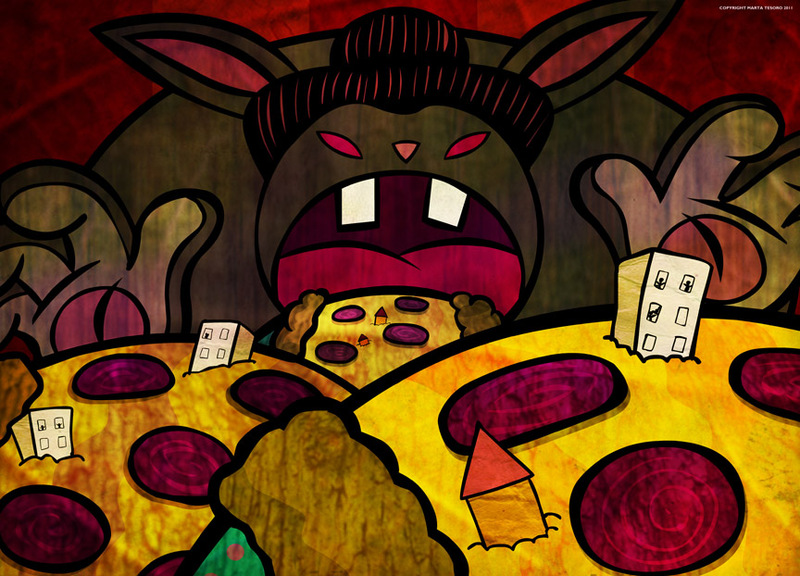 Drawing Request 07: Giant Evil Sumo Rabbit Eating the Longest Pizza. It has been a long time since I drew up one of the drawing requests. Here's the 7th one out of ten, huzzah! I had a lot of fun playing with textures on this one. For those that don't know what these drawing requests are about, please have a look at this previous post. All done in Flash and then brought into Photoshop. Been questioning a lot of stuff lately, like my abilities and what I need to improve on, what else do I need to learn to both prolong and further my career. Keep animating, reading books and watching other animations to improve my own work. Trying out new techniques and learning things like AS3 keeps me rather busy. I am working on a couple of small gigs while waiting for the Pilot work to start up again. I really like keeping busy. I always feel like something is wrong when am not doing stuff. I like stopping and smelling the roses.....but I may be drawing them while I enjoy their scent. Watched Kung Fu Panda 2 today and it was AWESOME!!!! Love it! Love it! Love it! Can't wait for my "Art of Kung Fu Panda 02" book to arrive. Very disappointed that I can't seem to find the first book anywhere! This is simply amazing!!! WONDERFULLLLLLL!